Sunday and Monday - Rabbi Goldman will be dropping in to Kings Court and other residences to greet students and parents, sell and install Mezuzahs, kosher kitchens and warmly welcome everyone to the loo! 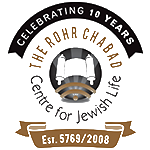 Tuesday 4-6 PM - Chabad's annual All Fired Up Welcome BBQ! Details here. Friday at 7:00 PM - The Season Premier of Shabbat Dinner @ Chabad! Kabbalat Shabbat services at 6:30 PM. This is the timing of every single Friday night service and dinner at Chabad, throughout the fall and winter semesters. Rosh Hashana begins on Sunday evening, Sep. 9th. Click here to view our full High Holidays schedule and RSVP for services and meals, and know that you're already a member; you belong at Chabad!